Originally derived by Yoki Shiwog Gomarabat approximately 2500 years ago from Northern India, a great founder of Thai Massage but also a master in herbal medicine. Thai Massage now is widely spread throughout Thailand and is readily available from a multitude of shops, along the beaches and even found on sidewalks throughout Bangkok. Prior to becoming a common tourist activity it was originally seen as a spiritual practice and only found in temples and hospitals. Its origins have derived from many areas including India, China and throughout South East Asia. Even now within Thailand there are many variations depending on the region. Thai Massage differs greatly from its Swedish counterpart, which is commonly practiced in North America. While the benefits of each style are similar, how they are performed are quite different. Unlike Swedish massage that’s practiced on a massage table using strokes applied with oil or lotion, Thai Massage is performed on a pad lying on the floor with the receiver dressed in comfortable clothing. The techniques consist mostly of slow, rhythmic compressions along Sen lines (energy lines) followed by a series of stretches. Thai Massage is commonly referred as “lazy man’s yoga” due to the addition of passive stretches, some of which resembling yoga postures. A traditional Thai massage involves the entire body but a large percentage of the treatment is performed on the lower limbs. In traditional Thai Medicine it is believed that the body is made up of four elements (earth, fire, water and air). When all of these elements are balanced the body is in a state of homeostasis and health. When one element is imbalanced, discomfort, injury or illness can result. Earth elements are seen as hair, nails, muscle, bone and organs. Fire is seen as body temperature and heat for digestion. Water is blood, sweat, bile, saliva and lymph. 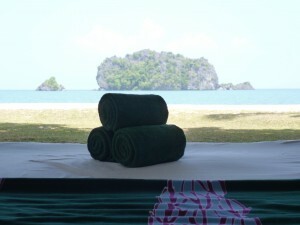 Air, more commonly known as Wind is the most important element for Thai Massage. In Thai culture wind is seen as air thats inhaled from the lungs and flows throughout the body along the Sen lines. An area of stiffness or discomfort in the body represents itself as trapped wind. Another common element in Thai Medicine are their beliefs that treatment does not occur only in times of disease and imbalance but also used to facilitate the body’s normal functions and maintain proper health. Sarah Nottingham, RMT studied Thai Massage at Phussapa Thai Massage School in Bangkok, Thailand. Book a Thai Massage appointment with Sarah Nottingham, RMT.